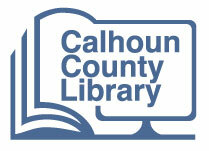 The Friends of the Calhoun County Library (FOCCL) is a 501(c)3 non-profit organization that sponsors and supports library book clubs, fundraisers, teen internship opportunities, and library advocacy efforts. FOCCL book sales are held in the Friends Room of the Library each Tuesday from 2:00 – 5:00pm. Be sure to check the Library for dates and locations of the annual Holiday Bazaar. Keep up with the latest on the Friends by following them on Facebook.